Ed Ruscha is perhaps my favourite living Artist. His work is quite simply iconic. He’s one of those few artists whose works have seeped into the fabric of modern culture; it’s quite likely therefore that even if you don’t think you know his work… you probably do. It’s true that he’s more often known for his canvas work than his photography, but that same spark that ignites, (quite literally sometimes,) his other pieces is present in his photography too. I’m one of those people that believes there’s merit in all Artistic endeavour and try not to judge the works of others either too harshly or too favourably. However, there’s no denying that in photography we are heirs to the legacy of true giants; Eggleston, Bresson, Adams to name but a few – I think Ed Ruscha keeps their company quite nicely. Great composition, reds hues, & light. I will have to look up his work! Excellent composition. Love it ! wow, very good idea and fine combination. i like it! The blue jeans provide a very nice accent to all the red. I like it! Very nice theme, warm colors and some really nice compositions! Well said, Martina! You beckon a desire in me to brush up on my art history – so many good ones mentioned. This composition is just splendid with a charming feel to it. Great composition, your use of RED makes it out of the ordinary! 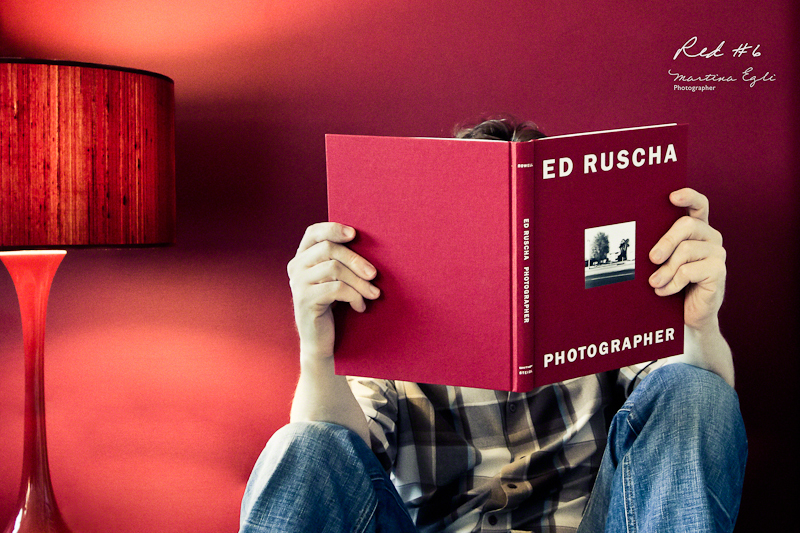 The combination between the non-red reader and the red everything-else works very well. I also like how the lamp balances the image towards the reader. Well done! Great shot – and thanks for the link. Love the colors in this one! very vibrant! The subject matter is awesome too!